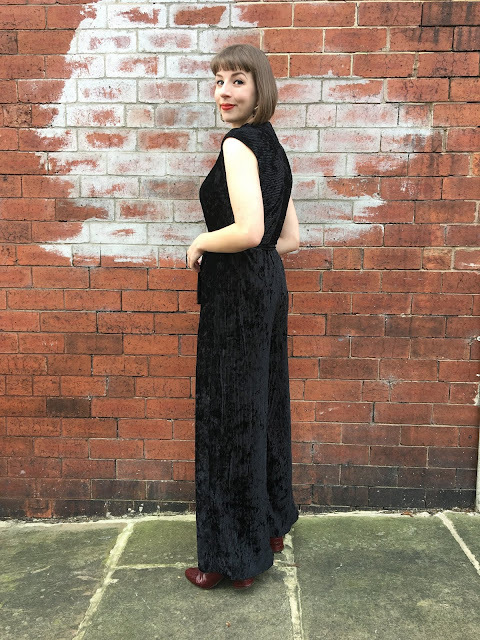 Here's the final hangover from 2018, an experimental and show stopping Sewing Leftovers effort that cut its teeth as my party-wear of choice for the festive season! 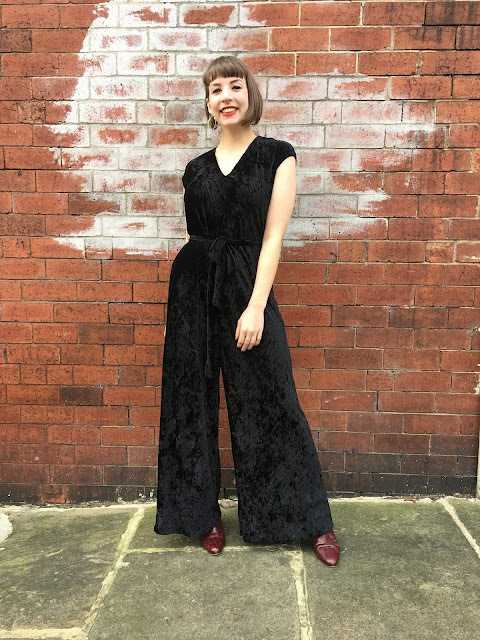 I drew upon some of my favourite patterns from my collection and of course, the leftovers of this bargain bin fabric, and was proudly able to dance around my work's Christmas do telling everyone my jumpsuit cost less than a fiver. January's pretty low on the party front, but it's dying for another spin - please someone give me a reason to celebrate! A Jazz Jumpsuit mash up! Leftover fabric amount: Just over a metre, with a sticky out chunk on the end! Leftovers-wise what did I learn? : Sometimes you have an idea in your head and you just can't let it go, even there isn't enough fabric left to bring it to life, so... all the cutting rules go out the window. The pockets were the first sacrifice and after a bit of pattern tetris, I started using the grainline and cross grainline interchangeably. This meant some neatening up during the project in order to make my wonky masterpiece work! I'd decided that I needed a pair of luxe, wide-leg party trousers and this fabric came to mind. 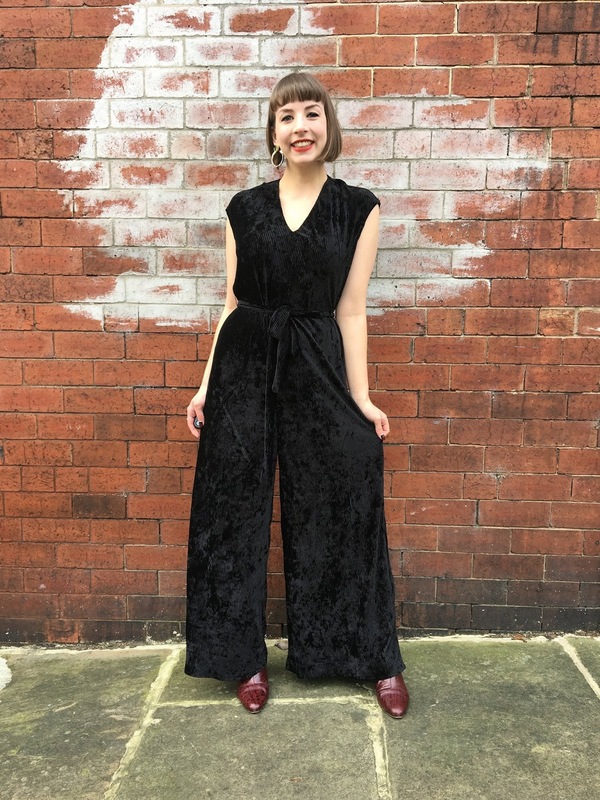 But surely there was enough to make a jumpsuit? There wasn't, really, but my mind was already set. Cue the most frustrating afternoon of the year, trying to somehow make my pattern pieces fit. 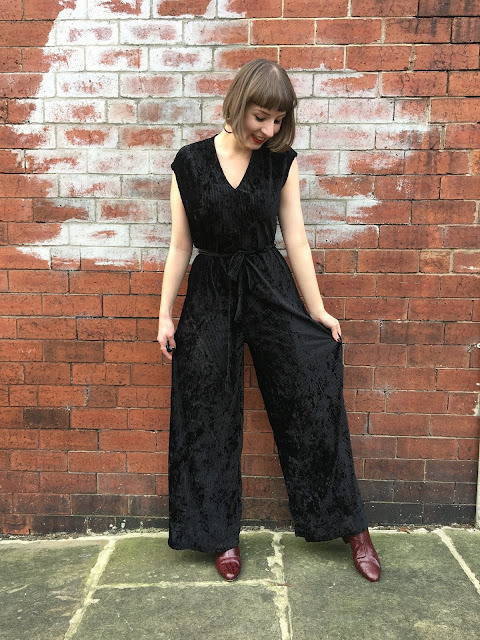 The leg pattern pieces of the Jazz Jumpsuit were too wide for my leftovers but the B6178 culottes were a good swap - they're straight and a little narrower so I could squeeze both legs onto my fabric when placed on the cross grain. 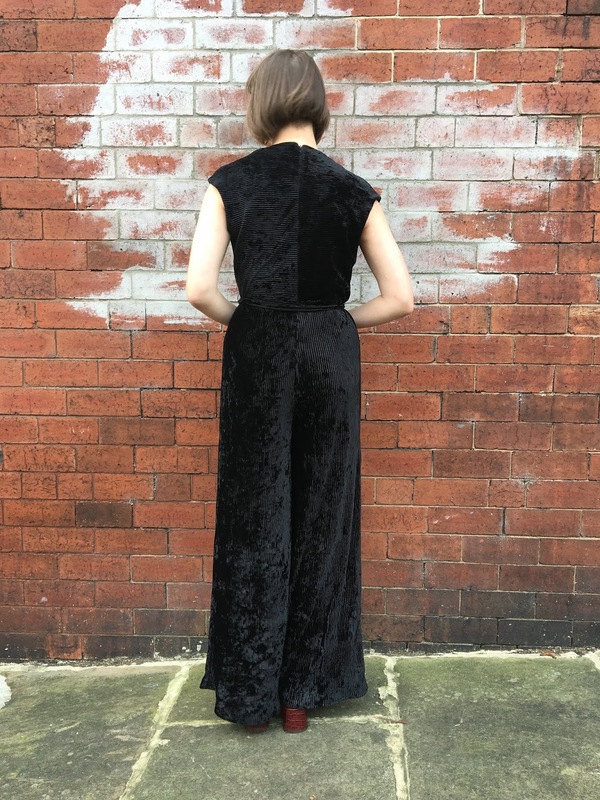 I had no worries about this as I'd cut my Nikko Dress in the same way so that the ribbed texture of the crushed velvet/velour ran vertically rather horizontally. The loose Jazz bodice needed narrowing quite so the culotte bottoms could be gathered in to the waist. I skipped the darts on the trousers in favour for a little more fabric to gather in too. The bodice front was squeezed out of the fabric left between the crotch curves of each leg, but I struggled to tetris the two back bodice pieces in place and that's why - you may notice - the ribbing runs horizontally across the back. I'm all for switching between the grainline/cross-grainline, but I wouldn't normally recommend mixing the two! I definitely had even out the bottom of the bodice, which sagged all over the place when sewn together. I got the fabric from a grab bin for really cheap because it has some pretty big flaws in it. I'd managed to avoid some of the bigger ones with my Nikko Dress, but just had to go with whatever fabric I could for the jumpsuit pieces. It's not ideal - you can probably spot some of the flaws in these pictures - but maybe there's something about it that adds character? On the upside, I used every last bit of my fabric apart from a few tiny slithers. Back view - and horizontal stripes across the back bodice! Having made both patterns before, the construction was really simple, especially as I had to give the pockets a miss. The fabric has some stretch to it, so I had to stabilised the centre back edge with interfacing before inserting the zip. 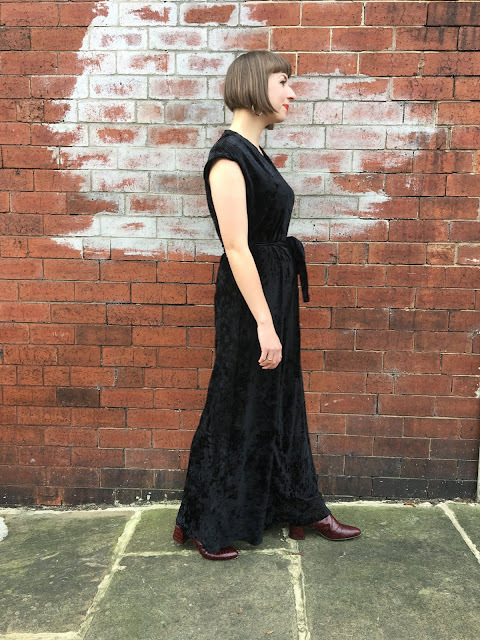 I also tried to stabilise the shoulders with a scrap of selvedge fabric as there's quite a lot of weight hanging from them, but I ended up having to redo the neckline and shoulders as this made it too bulky. The project did become more involved towards the end, with quite a bit of hand stitching required to finish and neaten it up. Despite understitching the neckline facing, this fabric was desperate to roll through to the right side, so it's carefully tacked to the bodice. I used satin bias binding to finish the armholes, hand stitching it in place for a neater finish. I also constructed little thread belt loops using this YouTube tutorial to hold the waist tie in place. All in all, it was worth the headache of cutting it out, the risk of dodgy pattern placement and the patience required to finish the jumpsuit because it's SO GOOD to wear! I wasn't sure the statement wide leg trouser would 100% work for me, but it feels and looks so fancy (whilst still maintaining the comfort level of pyjamas). The drape and movement of the fabric has made this idea just as good as I imagined, if not better. I would happily make the same pattern mash up all over again if I had the leftovers for it. I'd maybe even consider sourcing some new fabric for a second version, should the occasion call for it. For now though, I have my go to - send those party invites my way! I am in awe of your squeezing this out of just over a metre and also a very timely post for me as I have a few lovely leftovers that really deserve to be used in 2019. Thank you for the inspiration. I am called Rebecca but for some reason Blogger doesn't want to include my name today. OMG!!! 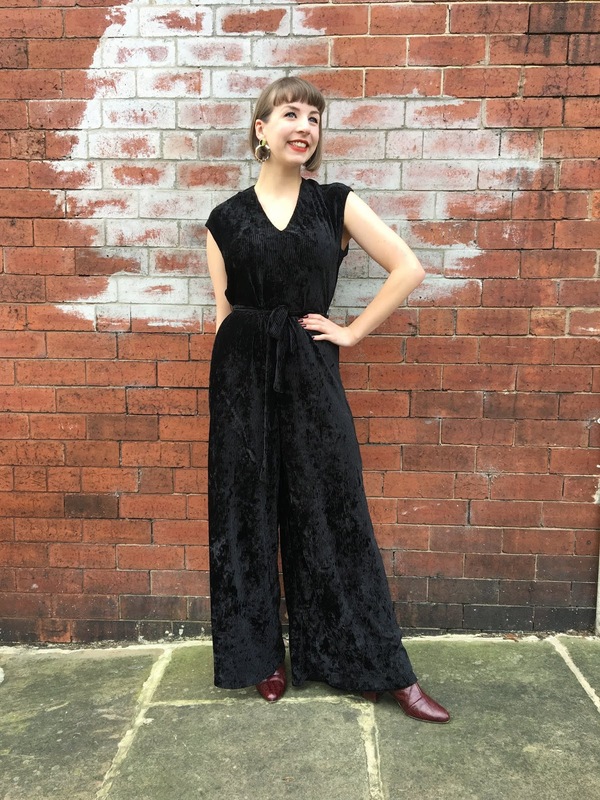 Your jumpsuit is amazing!! And you definitely win the pattern tetris Olympic gold for cutting it out of just over a metre! I definitaly know that feeling, that an idea has set in your mind and you cant let go. And good that you didn't! Tour trousers look amazing!